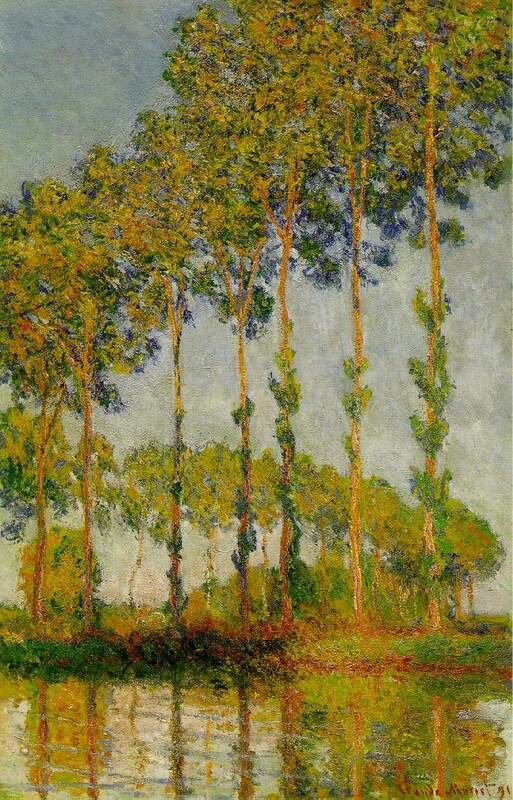 Monet painted the tall poplars on the banks of the river Epte near his house at Giverny under varying climatic and seasonal conditions in 1890 and again in 1891. A row of tall vertical stems backed by a receding line of other poplars provided the basic arrangement which he observed from his boat. He began his series of Haystacks before he had finished with the Poplars, a distant line of trees often forming a background. In both series he took enormous pains to wait for and entrap exactly the light each picture demanded. Yet in spite of the stubborn effort made with the aim of attaining a complete objective truth, causing him to take out a whole set of canvases to the chosen site on which he could work one at a time as a particular phase of light allowed, another element insidiously crept in. The subject in constant repetition came to matter less and less; aesthetic considerations apart from a scientific naturalism came into play. The slenderness of the poplars seemed to take on something of the exaggerated elegance of the contemporaneous art nouveau . The color scheme became more of a contrived and artificially heightened contrast between blues and purples, oranges and yellows. 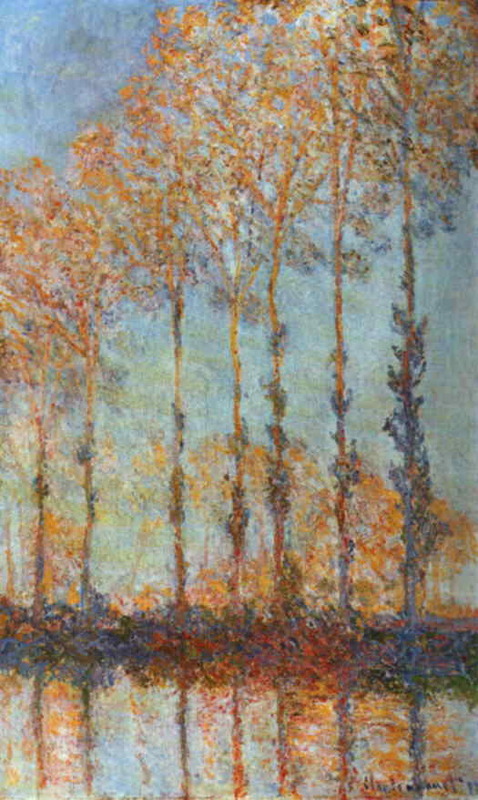 The new aspect of Monet's art after he had reached the age of fifty can be appreciated in the ecstatic color of this example. With the public the series were a great success, the Haystacks especially. Fifteen of them exhibited at Durand-Ruel's were all sold within a few days at 3,000 to 4,000 francs each. But there were some critics and some among Monet's Impressionist confrères who were dubious of the course he now pursued. The adverse opinion gained strength that Impressionism so interpreted involved too great a sacrifice of substance and construction. Yet they attached too little value to the poetic and abstract characteristics of Monet's art.